(1) A cute little farmer’s market stuffed set. The milk actually has a little mirror inside. Peek – a – boo! (2) Mini Boden is always a home run in our book. The little reindeers make it the perfect seasonal dress. (3) We both own these blankets for our kiddos! They are AMAZING and so warm!! (4) Every little baby needs a hippo ballerina play mat, right?! We agree! (5) A bright wooden walker to help those wobbly legs get stronger. Love Hape products. Amara is the happy owner of this walker. It will last for years! (6) If you love the crafty look of felt hair bows, but don’t have the time or the talents to make them, buy them! (7) Keep those chubby baby legs warm all winter long with these polka dot leg warmers. The only downside is that you don’t get to see all of those fat wrinkles, which…hello!?! They are the best. (8) We love trendy outfits just as much as the next fashion forward mom, but we also want our kids to be comfortable especially when they sleep. 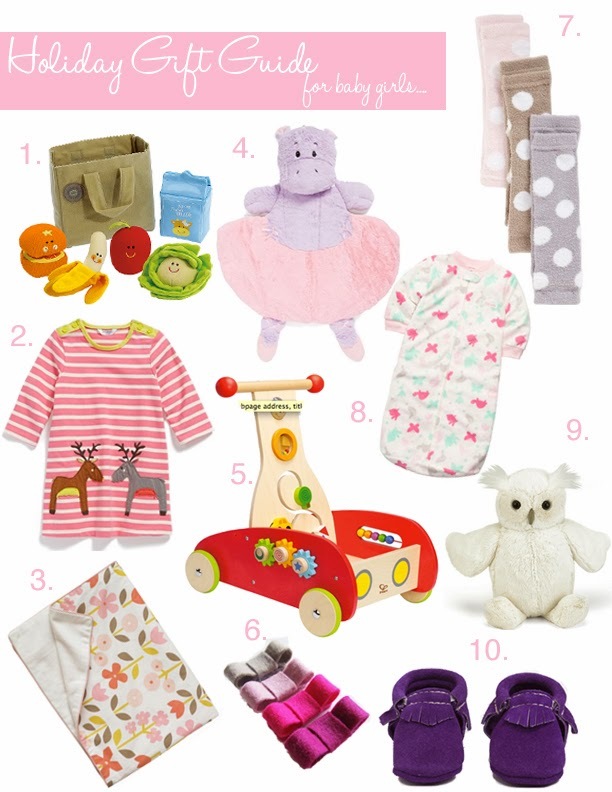 These Carters fleece sleep sacks are so warm and come in the most adorable patterns. They also have footed ones for your toddlers! We live in these during the winter months. (10) I feel like these moccs need NO introduction, but if you haven’t hear of them or tried them….please do! Not only are they quality shoes that stay on your littles’ feet, but they come in the most beautiful colors. Available in leather and suede. We love Susan and her team too! !